Although the term ‘Jamaican bobsleigh team’ may sound like an oxymoron to us, it doesn't sound that way to the actual Jamaican bobsleigh team themselves! Yeah! Straight up. And that's precisely why their slip sliding story has been brought to you by the Director: Jon Turteltaub; and the Actors: John Candy, Leon Robinson, Doug E. Doug, Rawie Lewis, and Malik Yoba. It ran its course in 1993, and lasted for a whole 98 minutes. Jamaica and bobsleigh: These two words don’t seem to go together very naturally, don't they? Still. To the likes of Derice Bannock (Leon Robinson) -- yes -- yes they do. 'And why is that?' you may ask yourself, dear reader. Well, after an unfortunate accident during his Olympic running trials, Derice bands together with an old family friend -- called Irv Blitzner (John Candy) -- plus some like minded Jamaicans -- Sanka Coffie (Doug E. Doug), Junior Bevil (Rawie Lewis), and Yul Brenner (Malik Yoba) -- to partake in this dangerous winter-based sport. Granted, each member does show some apprehension in participating in this icy past-time at first. Particularly when you take into consideration that the Olympic games in Calgary is only a mere three weeks away, and they don't have no money, no hope, and no chance at a slipping and a sliding. Nonetheless, through the course of this joint venture, each man finds it within themselves to steer a path to bob with the best of them. No holds barred. Yep. That's correct. They practice every day. They raise the money they need. And they even get better in their chosen sport too. All resulting in ‘Calgary here we come’, YEAH-MAN! 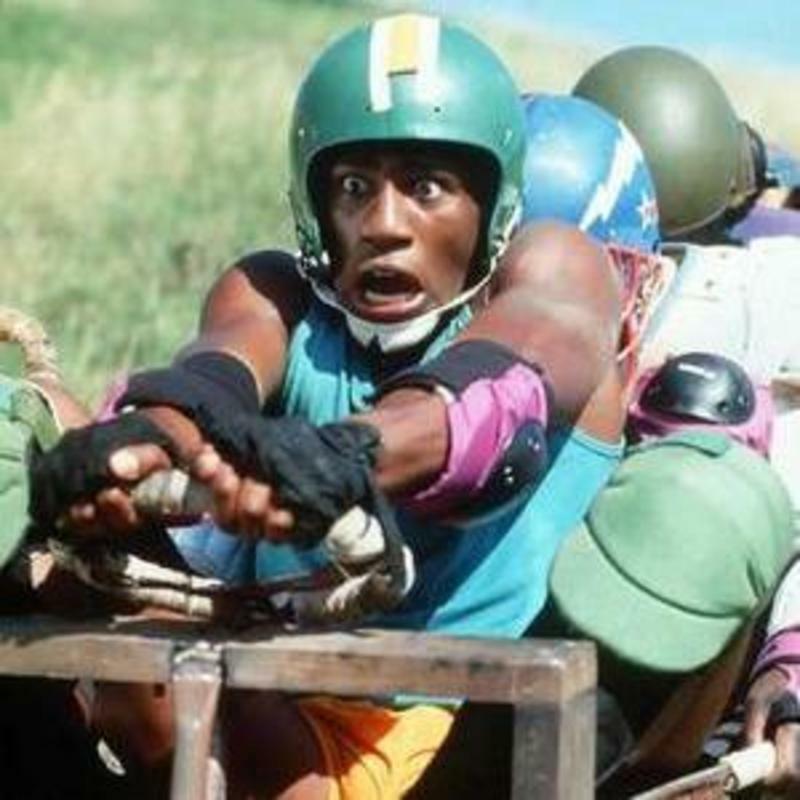 However, once in Calgary , I'm sad to say that things don't really get any better for the Jamaican bobsleigh team. AGAIN! The weathers bad. The team is held in contempt due to their inexperience. Plus Irv’s dubious track record with the Olympic committee doesn't help either. So what should Irv and 'the gang' do about it, huh? Forge ahead come what may? 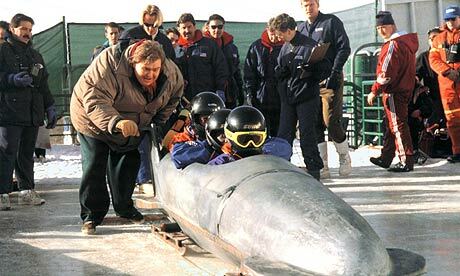 And then fight against any foreign schmucks who dare bar their path to bobsleigh freedom? Hmmm. That does sound like a plan. Doesn't it? But then again that's most probably why what next transpires all kicks off when a couple of Germans stick their boot in. As a team is barred - Jamaicans find it hard - Irv gets wrecked - and at the end of the ramp it's all about, RESPECT! Without beating around the bush, folks,I'd say that 'Cool Runnings' is a fantastic piece of filmmaking on three different levels. Firstly: it tells a pretty decent uplifting 'real life' story of the sporting kind. Secondly: a character arc is reached though the telling of said story. And thirdly, it’s bloody funny as well. Yeah. No messing about. This film is just one of those films you can't help but kick back and relax to every time you watch it. Honestly, there is no need to try to figure out what is going to happen next -- or why -- because it's simplistic structure and execution is such a joy to follow, you're just happy to be along for the ride (pun intended). Just take a look at the overall narrative for instance. Step One: A reluctant team comes together. Step Two: They train. Step Three: They get laughed at. Step Four: They overcome all odds. And Step Five: At the end of the day they win something far greater then what they set out to achieve in the first place -- honor. But wait a minute, before I continue praising this piece, please allow me to present you with some filmic-facts: (1) 'Walt Disney Pictures' first release this $14 million dollar production on the 1st of October, 1993, and eventually clawed back $154 million dollars at the box office. (2) Yes. 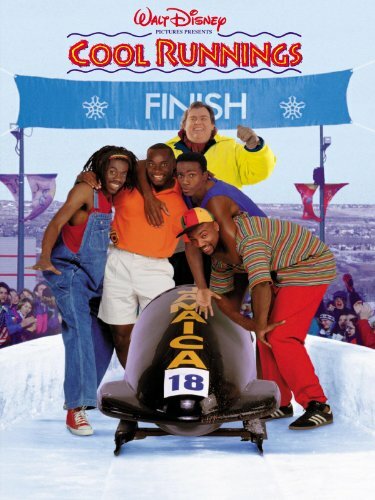 This film was very loosely based on a true story about a Jamaican bobsleigh team. Yet in real life, when the real Jamaican bobsleigh team met their real competitors, they were greeted with open arms to such an extent, their foreign allies even gave them certain pieces of equipment because theirs was so shabby. (3) Did you notice that the crash scene depicted at the end of the movie was taken from the 1988 Winter Olympic Games? (4) Its a little know fact that you 'are' allowed to add weight to a bobsleigh in competitive racing, because it makes up the difference from 'your' weight and 'your competitors' weight -- if any. (5) If you look very closely at the scoreboard, you'll notice that 'England' was listed, although it should have been 'Great Britain' instead. Furthermore, even though this film states that it took place in 1988, you can tell that certain automobiles in it were manufactured in 1990. (6) I noticed about three movie reference scattered throughout this film. First, there was a 1932 'Tarzan the Ape Man' reference: 'You are the kind of club-toting, raw-meat-eating, Me-Tarzan-You-Jane-ing big bald bubblehead'. Then there was a 1940 'Knute Rockne All American' reference: 'I'm not good at the win one for the Gipper speeches'. And finally there was a 1988 Die Hard reference: 'Yippy ki yey!'. 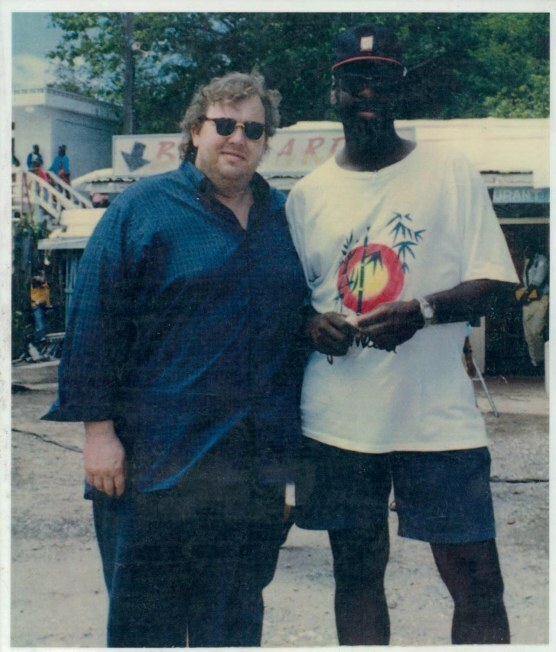 (7) The majority of this production was shot on location in Jamaica, plus in the Canadian province of Calgary, Alberta. OK, I know there are some people out there who would have preferred 'Cool Runnings' to be a lofty melodrama with high falutin rhetoric, depicting a factual based sports drama. But f**k that! Go and watch a documentary for that type of thing. This is a story based on a true story, with additional character and comedic elements sewn into it, just to make it a worthwhile piece of entertainment. And that is precisely what is at the core of this film, dear reader -- entertainment. Thankfully, all the main players do a great job of making this happen -- especially Candy and Doug. And even though the main cast may seem very one dimensional on the surface, underneath it all a progression is truly made by the end of this production. Heck, at the end, I almost bloody cried myself!!! Soppy: I know. But not this film. No way. It's a truly fun character piece involving a fun sport, fun actors, and a fun vibe. 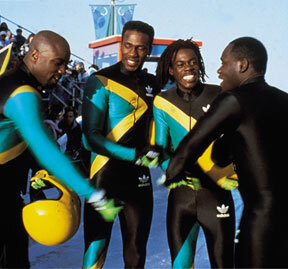 Don't you agree original Jamaican bobsleigh team?